In this article, I will cover 5 free comic creator for kids websites. Drawing is a good way to let kids show their imagination. This also helps an adult to understand a child better. And with comics, they can also represent their thoughts along with their imagination. The 5 comic creator websites on this list are very simple and easy to use. And, kids now days can easily use them to create comics without a problem. With these websites, you can instantly create awesome and fun comic strips. These websites offer various types of items, objects, characters, people, beings, chat bubbles, etc. to help you create your desired comic strip. Let’s start the list and discuss these websites one by one. MakeBeliefComix a free website to create comic online. It offers all the necessary tools and options that one can possibly need to create a comic. It has a wide range of characters, chat balloons, objects, fancy words, and backgrounds. The user interface is simple and easy means a kid can easily create comics here. To create a comic, first, it asks you to select the number of panels for the comic strip. The default number of panels is three which you can change as per your requirements. Then, you can add characters, objects, etc from its wide collection by simple drag and drop. When you add an object to your panel, a toolbar appears at the bottom of that panel from where you can move, resize, flip and delete the current object. And, in the end, you can print your comic to PDF or share it via email. Try this comic creator for kids here. 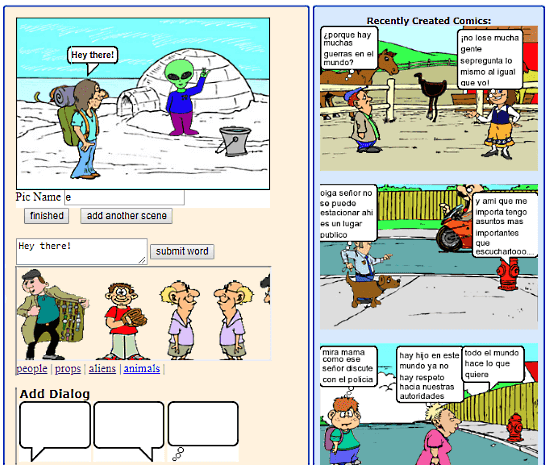 ToonDoo.com is another feature-rich easy to use comic creator. Kids can use this website to bring out their imagination. ToonDoo has a clean UI with all the tools presents at the bottom and all the items at the left. In the right, you have the area for the comic strip. It has a wide collection of items which involves almost everything you might need to create the comic as per your imagination. On top of that, it has a search option to quickly find the items from its collection. And, you can also upload your own photos to use them in the comic. The process of comic creating is very simple here. First, select a comic strip and then add the items by simple drag and drop. Here, you can also get options to arrange items; you can move an item to back or bring it to the front. Apart from that, you can tweak the colors of each item accordingly and create a ‘TraitR’ character of your own for frequent use. After creating your comic, you can publish it on ToonDoo and download it as PDF. Give this comic creator for kids a try here. StripGenerator is another free comic creator website to make black & white comic strips. This is by far the most simplest comic creator website on this list and that’s because of its small but well-sorted collection of items. To create a comic here, first, select a strip frame of your choice. There is no graphical background option here but you can fill it will light-blue color if you don’t like the white background. Then, from the Characters tab, you can add people or other beings to your comic. And, from the Items tab, you can add household or other items as well. 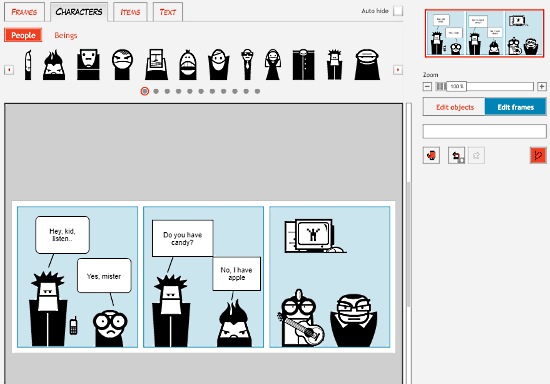 After that, you can annotate your comic strip with chat balloons and write your text. This way, a kid can easily create a comic with StripGenerator and save it in the form of PDF file. You can try this comic creator for kids here. WriteComics.com is a simple website to create colorful comics. If you want to make a colored comic and find first two websites a little confusing then this is the next best option. It has a small but good collection of people, property, aliens, and animals. You can simply click on any desired item to add it to your comic. It does not have any option to flip, rotate, or resize an item though. After that, you can choose a background environment for your comic from the Backgrounds tab. And, to add text, simply click a desired chat bubble/dialog. This will open a text box below the comic strip, enter your text there and click ‘submit word‘ button to add it to the comic. This way, you can easily create amazing colorful comics here. Try this comic creator for kids website here. ReadWriteThink.org is an educational website that offers free reading and language arts instruction materials. It has a simple comic creator tool that a kid can easily use to create comics. This comic creator has a small collection of people, beings, items and chat bubbles. You can browse through these items and add them to your comic by simple drag and drop. With the two arrow buttons at the top right corner, you can browse through different backgrounds to choose one for your comic. And, when you are done, you can print your comic to PDF with the ‘Finish‘ button. Check out this comic creator for kids here. All these comic creator for kids websites are fairly simple to use. Kids can easily use any of them to bring out their imagination and represent their thoughts and ideas.